We have about an hour left in 2018 and so I’m making plans for 2019. 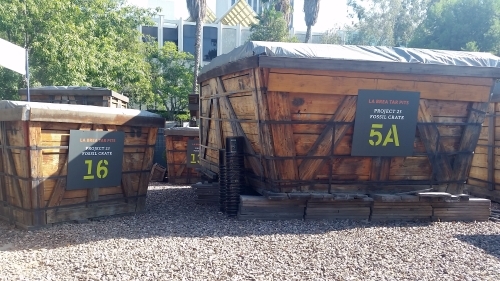 I was thinking that I could knock out the rest of the parks on my list of parks if I visited one a week but that doesn’t seem likely since I lost count around 120. So if I visit a new park a week, I’ll be able to string that along for at least two more years. Alex and I went to the Japanese Sunken Gardens on Christmas, and if my records are right and I haven’t written about them, that’s probably where I’ll start. So, tomorrow I’ll start working on my new post and you’ll just have to wait to see if I did get to go where the people were. 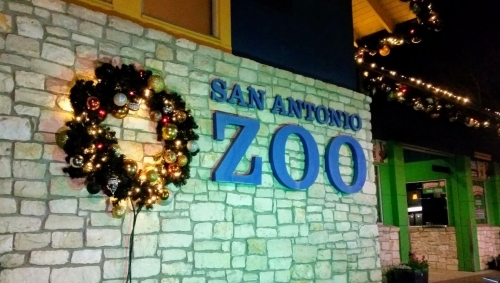 This year my Christmas photo is from, as it says on the tin, the San Antonio Zoo. Alex and I went to the Zoo Lights last week. I may post some more pictures later. I considered revisiting Orsinger Park the day I visited MacArthur but then I realized that I really didn’t need to because I still go there fairly often, largely to play Pokémon Go these days. But Orsinger has always been one of the parks we visited fairly frequently when Alex was young because it’s the only park we’ve found so far that had a sandbox. Orsinger was the sandbox park, Walker Ranch was the airplane park (because it is in the landing pattern for the airport), and Cibolo Nature Center (have I written on that one yet?) was the dinosaur park (because it has a cast of the dinosaur footprints found near Boerne Lake). 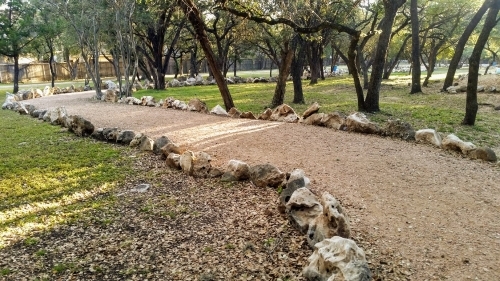 Orsinger is one of the parks of the Bexar County Park system. 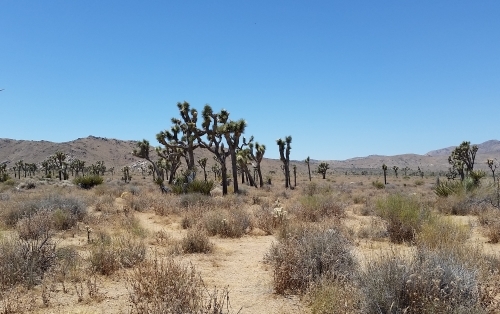 The land was donated to the county by Genevieve and Ward Orsinger in 1980. Genevieve was a dancer and a teacher (the Genevieve and Ward Orsinger Foundation website doesn’t say what she taught, but since her degree was in physical education, my guess is that she probably was what is colloquially known as a “gym teacher”). Ward owned a car dealership. Orsinger is a nice little park with a playground and a pavilion with an attached kitchen and a surprising amount of walking trails. The first time Thomas, Alex, and I left the playground area for the walking trails we kept expecting to come to the end of trails but we didn’t. I mean, of course we eventually did, because we’re not still walking around out there, or we didn’t die of dehydration or anything, but there were still a lot of trails. And I just realized that I don’t have any pictures of Orsinger. I figured that I’d gone on a photographic trip there at some point, but I guess I was mistaken. So I’ll be taking a trip out there and editing this post later, I guess. Finally. A picture. This is just a little bit of the walking path at Orsinger Park. I almost forgot my gratuitous Amazon link. This time the highest-ranked book I can find is Dirt Cheap Photo Guide to Grand Teton National Park by Jeff Clow. First, some more WordPress 5.0 grousing. I wonder if there’s some way to add, you know, visible lines outside this typing area. It feels weird just typing into a void like this. I’ve seen most of my San Antonio concerts at the Tobin Center, the Majestic, or the Alamodome. My only times going to the AT&T Center have been for San Antonio Rampage hockey games, and one Spurs game. As a result, I thought that leaving an hour before the concert would certainly be enough time when travel time was only 20 minutes. It totally wasn’t. After driving for nearly 50 minutes, the Uber left us off outside the building at 7:55 and then we had to get in line for security. And when the Uber dropped us off, there were lots of cars still trying to get in and when we were in line, there were lots of people in line behind us. One person behind us asked if we were sure the show started at 8 and that wasn’t when the doors opened. I looked up the show at Setlist.fm it turns out that the first song we heard (while we were looking for our section), Bennie and the Jets, was the first song of the concert. So we didn’t miss much. I also think that a mohair suit sounds itchy. I’m not going to go over the concert song by song, that’s what sites like Setlist.fm are for. Sir Elton’s voice is deeper now than it was when he first recorded most of these songs, courtesy of surgery on his vocal cords in 1987 and, of course, age has affected his voice as well, but he still gave an amazing concert. He seemed to still have such joy in performing. I know he’s retiring from touring to spend time with his husband and kids, but I hope he continues performing. During one of the extended jam sequences (Levon, I think? ), I wondered how someone who could play music like that could take drugs. I love music, listening to it and playing it (I sing and play the flute and piano and also have played in church handbell choirs) and I’m not amazing, but I always enjoy music so much that if I played anything like as well as Sir Elton does, I don’t know if I’d need any other high. One of the most pleasant surprises of the night was Ray Cooper. Cooper is a multi-instrumentalist musician whose specialty is percussion. Sir Elton has gone on tours with Cooper where it was just Sir Elton on the piano and Cooper on percussion. He’s just that good. I was blown away and, as I mentioned in my last post, when Sir Elton introduced his band, I joined the people who gave Cooper a standing ovation. I learned several things about Sir Elton that I hadn’t known before. The biggest one was that he hadn’t intended to become a rock star at all. He and Bernie Taupin (And why isn’t he Sir Bernard yet? Sure, Sir Elton is the face of the organization but the words are Taupin’s) had intended to be professional songwriters, but no one bought their songs, so Sir Elton sang them himself. Also, Taupin writes the words and then gives them to Sir Elton, who writes music to go with the pictures that Taupin’s words draw in his head. I don’t know if it’s a Texas thing or an artifact of the fact that I’ve been focusing on seeing artists from my youth and so the other attendees are around my age and thus more . . . mature? old? boring? but I usually end up sitting among people who are not nearly as enthusiastic as I am to be there. The people behind us, for example, didn’t even applaud and when I looked back at them, their facial expressions looked like they were just waiting for the concert to end so that they could audit Sir Elton’s taxes or something. So here’s the question. Should I: a. shell out more money for the next old person that I don’t want to miss and sit closer to the front? b. go to the next Reggaeton concert to come to town* and sit near where I usually sit and see if they’re more excited? c. go to see an old person somewhere else** and sit in my usual seat? Gratuitous Amazon link time. This time, given the subject and the theme of the tour, I’ll choose Goodbye Yellow Brick Road. Also, this is the album that has my favorite of his songs, Candle in the Wind, on it. *Nicky Jam is playing in Laredo in March. Since I think I’d have to go by myself, I don’t know if I feel comfortable spending two and a half hours on I-35 so that I can be the only 50-year-old white lady at a concert in a strange city where I don’t know anyone. Though I do hope to do more of that kind of thing once I leave Texas, so maybe I will. I have a couple of months to decide. **Cher is on tour this year. Unfortunately, the closest she’s coming to Texas is Omaha. At least if I end up going to Omaha by myself, I might not know anyone but I know the city. I wonder if they’re running a shuttle from the Even Hotel like they did for Lady Gaga? This is my first post in WordPress 5.0 and I hope I adjust to this, because it’s making me crazy. And I fully intend to go on more about this later. Much later. Like, after I get a full night’s sleep and eat at least one full meal, which means it’ll have to wait until after work tomorrow night, probably. Good night. *I’m one of the people who gave Cooper a standing ovation when he was introduced. Ray Cooper was really, seriously, awesome. **Both in the sense that it was awesome singing “Ooh-ooh-ooh, ah-ah-ah-ah, Ooh-ooh-ooh” with them during Goodbye Yellow Brick Road and in the “I was in awe of how many people were there.” They were selling seats behind the stage.